This weekend was my birthday and my girlfriends Mom sent me this neat robot kit. For some reason I felt like midnight was a good time to start assembling it. T3 Solar Robot in scorpion mode ready to attack! 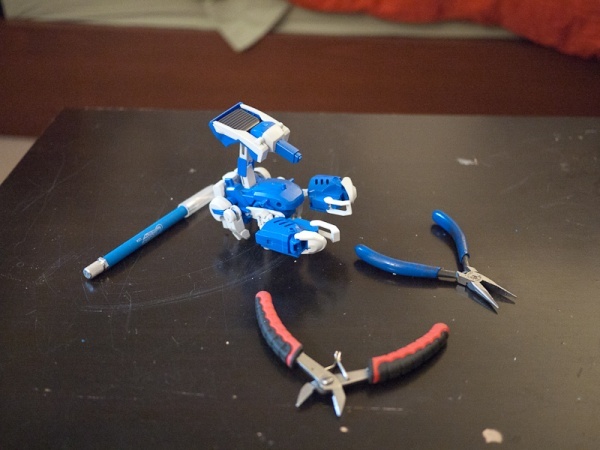 The box says it is a T3 Transforming Robot from RobotiKits. It transforms between human, scorpion, and tank mode. The scorpion mode spoke to me. I think it came out pretty good! This entry was posted in Projects, Toys and tagged Kit, Robot, Solar, Toy. Bookmark the permalink. What did the scorpion say to you?